Kartell is counting the hours and presents its first wall clock, Tic&Tac. 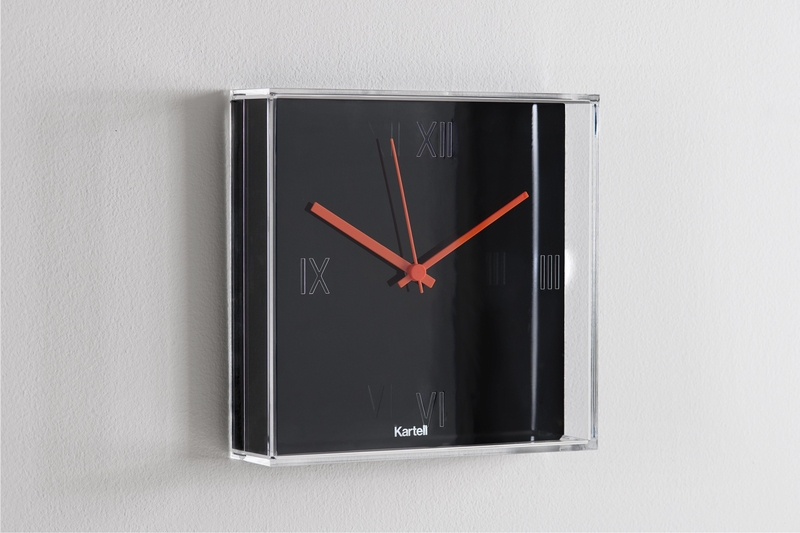 A squared transparent â€œboxâ€ measuring 30Ã—30 cm with Roman numerals engraved on the surface encloses a flat clock face and comes in three versions (white, black or chrome). Featuring three thin coloured hands for a chromatic synthesis, Tic&Tac transforms time into an aesthetic experience. A clock made of impressive depths that create a play of lights and reflections, the unmistakable touch of Starck is visible in the logo on the clock face and in the orange hands, a colour fetish of the designer.